all right, another post tonight. up goes a shot with the new lens, no thanks to my insurance company. told them the truth about the old one – a piece that worked the autofocus broke inside it – and it wasn't covered. whereas, i think many people would have purposely dropped it or misplaced it and then reported that damage and would have been paid...but that's another rant that doesn't belong here. so stuff was going on at the broiler tonight...a photo/video shoot or mini concert in the parking lot. lots of girls dressed in '50s garb and makeup milling about. i assume more cars would show up, but there really wasn't, at least while i was there. anyway, this old pontiac drives up. i've seen and shot it before elsewhere. while the owner isn't the friendliest dude to run across, and had grumbled at me last time, he never had a problem with it before. not sure why he puts a fugly flyer advertising some other vehicle for sale on his windshield. 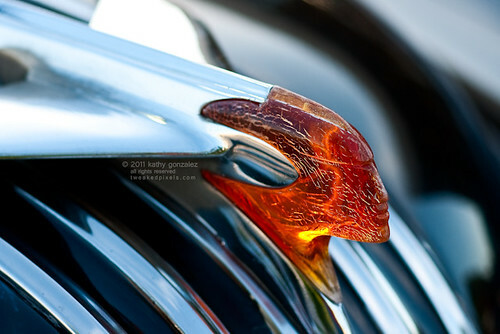 i did ask him if i could take a shot of the hood ornament, and he said yes. told him i had a new lens to test, though by that point i don't think he could care less. then he returned to the pack of car owners, which also included my everlasting nemesis, richard, so there was some explanation for his cantankerous attitude. so here it is. wish he'd parked around the corner, so the sun could have hit it and made it glow. i think the lens is a keeper.